Kids' mid-test is starting today until Friday with 2 subjects everyday. I wish all the best for both of them, hope they can answer all the questions correctly. Today, I put small portion of rice in this bento because the kids would have their lunch at home during this week. School will be dismissed 12pm during mid-test week. I made bear from half of boiled egg decorated with nori and crab stick for the face. I soaked the boiled egg in the light soy sauce mixed with water for 10 minutes. Inside this box : rice burger (put BBQ burger meat between 2 layers rice), pork sausages, corns, green beans, edamame, carrots, fried tofu, and strawberries. The cute bear looks like he's made of fine porcelain! I also like your flower details on the sausages. Love all the colorful details and the carrot cuts. Bear egg is perfectly done, of course. Good luck to A & A! I'm sure they will sail through easily! Hello Lia, your blog has become one of my favourite. I will visit it very often to check out your creativity. Really love it so much! And not to forget, Good Luck to your kids and wish them passing the exam with flying colors! @Funn's : Thanks a lot Funn for your kind comment and your wishes for the kids! Love to share this bento hobby through my blog. Are you blogging somewhere? Can I have the address? hehe, cute bear!! good luck to the kids! The bear looked so perfect!!! YOur dyeing skill is very good Lia! Mine always have patches whenever I dye those eggs! Lovely bento and I hope your kids perform well in their exam! The cute bear looks like from a mould not an egg. Clever way to change the colour from soaking. Now I learned something new. Thanks Lia. @Anncoo : Thanks a lot too Ann! I love the colour of this half egg! It has come out looking like porceline/ceramics, I think, beautiful finish! Good luck for the kids exams! Hope ur kids will be doing well for the mid test, all the best. this one is soooo cute lia! the bear looks so delicate, and the two picks you've chosen are very complimentary. i like the zig-zag-cut carrot too! best of luck to your little ones on their tests! Wow! For a moment, I thought it was a porcelain toy bear! I was really shocked to find out it was an egg! What impecable skills you have in dyeing the egg and decorating it! Tks for sharing!! All the best to your kids tests! Oh it looks so pretty! I love the bears - looks miles nicer than mine did and they came out of a mold! this is really sweet :) well done on the bear. Gemes deh sama pipi-nya si bear, pengen nyubit jadinya. Great that cutworks of these hotdogs flowers! That's a nice idea! I may swipe it...ehehe. Thanks for sharing the tips on colouring the egg. Hey, how come I missed this one? 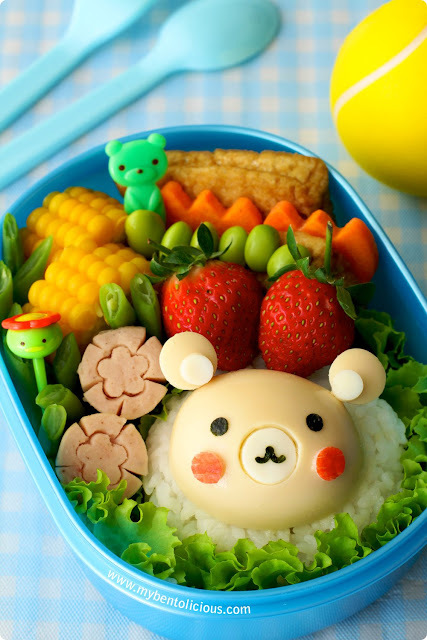 The bear looks cute, reminds me a bit of Rillukuma :o) And I love the carrot cut out with the the edamame in front of it. Just perfect. I hope the kids will ace their tests! Nothing but bear-y sweetness here! I love how the animal pick continues the sweet bear theme...and all of the wonderful, carefully placed elements! Such love and care go into your bentos, it's no wonder they bring joy!